Human cannibalism might evoke Donner Party-esque tragedy or chianti-loving villainy - but for some animals, like the multi-armed cephalopods, eating your friends is just a way of life. 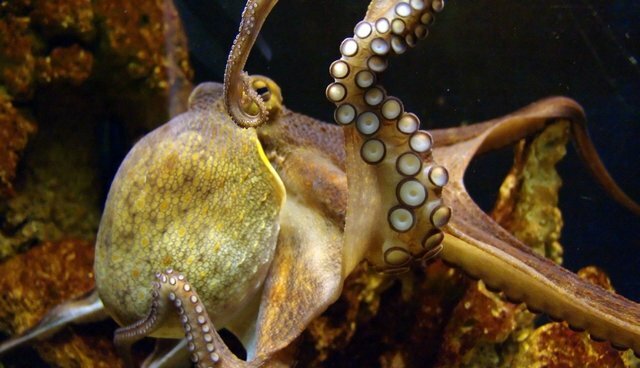 And for the first time a group of Spanish scientists have documented the way common octopuses (Octopus vulgaris) eat each other in the wild in a recent Journal of Comparative Psychology report. For years, marine biologists have noted that some squids and octopuses eat each other, based on lab observations, coming across partially-digested stomach contents and the occasional National Geographic video. But factual evidence was sparse, the Spanish researchers say, until they reviewed three instances of cephalopod cannibalism captured on camera in the Mediterranean Sea. In all three cases, the predator octopus was much bigger - four to five times - than the prey. And both male and female octopuses were spotted en flagrante cannibalo. They also preferred to nosh on the smaller octopuses in the comfort of their own homes: "Once captured and dead, the prey was transported to the den which in turn was plugged with stones of different sizes," the scientists write. "The predator began to eat its victim by the tips of the arms." Plenty of other gustatory options - specifically, an abundance of mussels - didn't seem to deter the cannibals. But prying open mussels is a tricky, energy-consuming business, even when you have eight sucker-tipped arms. Octopus meat is higher per-gram in protein than mussels, too, leading the scientists to believe that octopus cannibalism is driven by energy efficiency. Octopuses oddities don't end with cannibalism. Along with passing ink sort of like the way mammals pass gas and being incredibly devoted moms, octopuses have been spotted munching on their own arms.